Dinner number two under the Dukan diet. Tonight I tried to add variety. We had a delicious filet mignon from Trader Joes, mostly organic. I prepared it on the grill along with the octopus and shrimp. I just seasoned it with salt and a lot of crushed pepper. I wanted to put my William Sonoma au poivre seasoning, but it had too much oil. 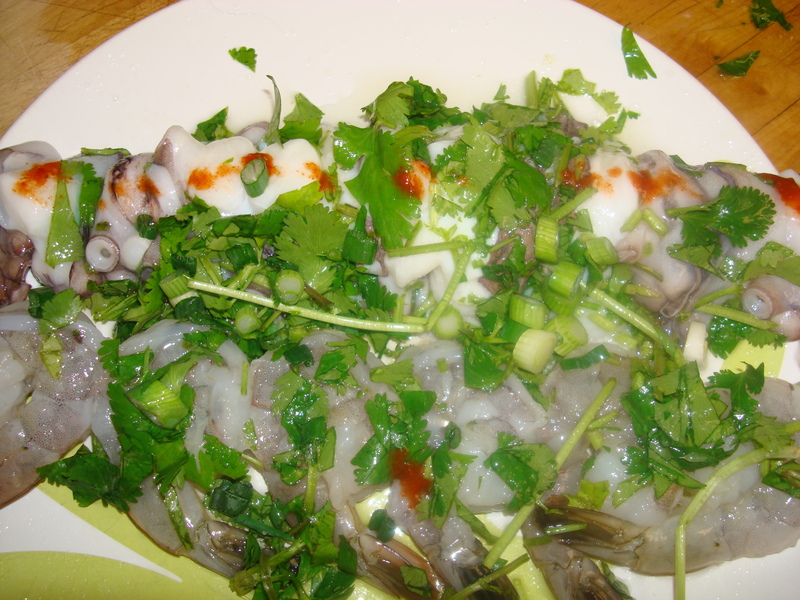 I also thawed out the frozen octopus and marinated it in a cilantro and lime marinade as well as a few jumbo shrimp. That’s a lot of food! However, when only eating protein, it’s not much. I also made veal. I found a nice butcher in San Pedro. It’s hard to find a butcher around here. I was truly spoiled in Italy, there was one on every block. I wrapped each veal piece with one slice of red onion and one piece of sage. I squired each role. The veal was for the 3rd protein day’s lunch, but we snuck a piece each, leaving Paul 2 for his lunch and me up to my own accord. Dinner was a success, well minus the octopus that had the consistency of an uncooked snail or a really tough piece of rubber band. I didn’t pre-cook it. Later I remembered how long I had cooked my octopus when I made it for the first time, when living in Italy. 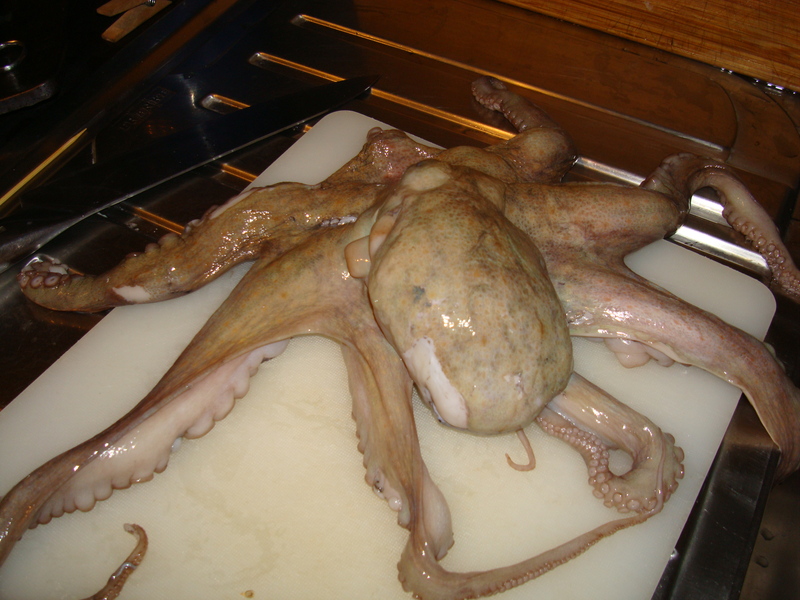 I was so happy and proud when I went to the market and bought my first octopus. I also remember getting my octopus out of the bag and realizing I didn’t ask for it to be cleaned!!! I had to youtube a Jamie Oliver clip to see exactly how. It was a bit overwhelming, but I did it. I managed to get the little teeth out of the head and pull the head inside out. basically how I felt when I learned I needed to clean it! Doesn’t seem appetizing, but it didn’t turn me into a vegetarian, yet. I’d been told by several locals to freeze it for at least 24 hours to give it some tenderness. 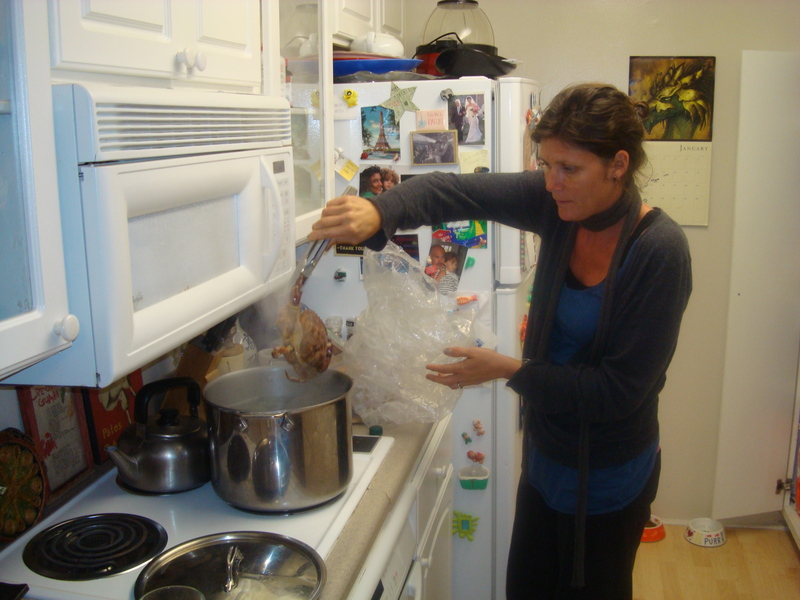 Then you cook it in wine for a very long time. This time back in the US, I must have lost a bit of my memory because somehow tI felt 15 mins on the grill would be delicious. I had read a recipe that said to grill for 15 minutes, but later after our meal I read the fine print. The grilling for 15 mins, was after a few hours of stewing! But never-the-less our dinner was great. 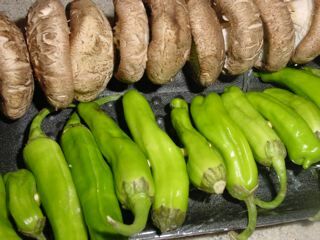 A bit different from our first, still as bizarre, in the fact that our veggie was just the size of a garnish. Paul and I decided to do the protein diet one more day. Breakfast, snacks, lunches: We’ve been eating hard-boiled eggs, not more than two a day, yogurt-greek style and european style. All are fat-free. I’m getting used to it. I think what we miss the most is wine. But in general, we are living on coffee, Perrier, yogurt, tofu and proteins. I’ve lost 3 lbs so far. I did the Dukan diet true weight and I don’t have too much to lose, but need a jump start to the new year. I really over induldged over the holidays, it started at Halloween. So it was time to do something serious. My profile from the Dukan site said I’d do a 2 day protein and then a mon/Thurs protein day with the others protein and veggie, for 20 days. I don’t have many days left, well, two weeks, but it seems ok so far-day two. hahaa. Paul has been having much better lunches than me. I’ve been making him his before he goes to work. I just snack in between working at home. I missed a post so I will add in my Dukan Diet Day 3. We had grilled swordfish, calamari and shrimp. 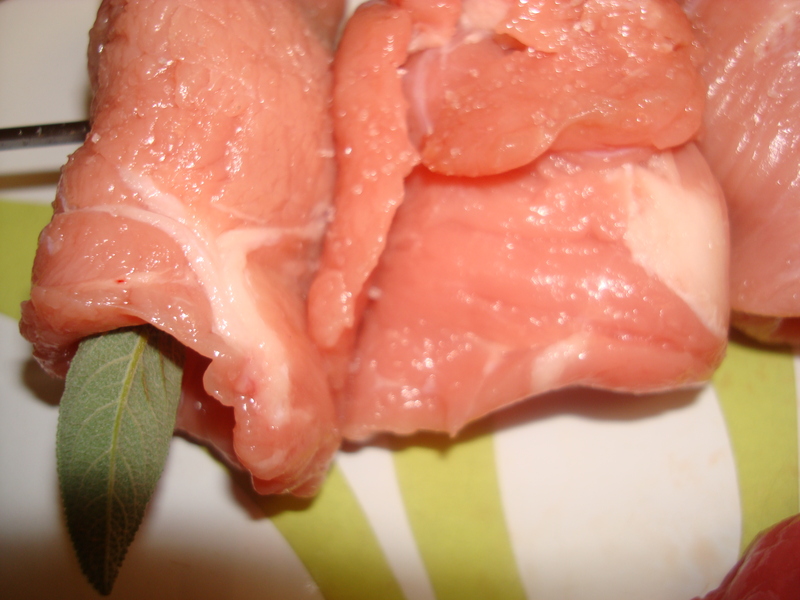 I used two frozen swordfish steaks and cut it up into pieces. I also used previously frozen calamari that I’d purchased from the seafood/fish docks in San Pedro. I used the same dressing as the previous night. Cilantro and lime. 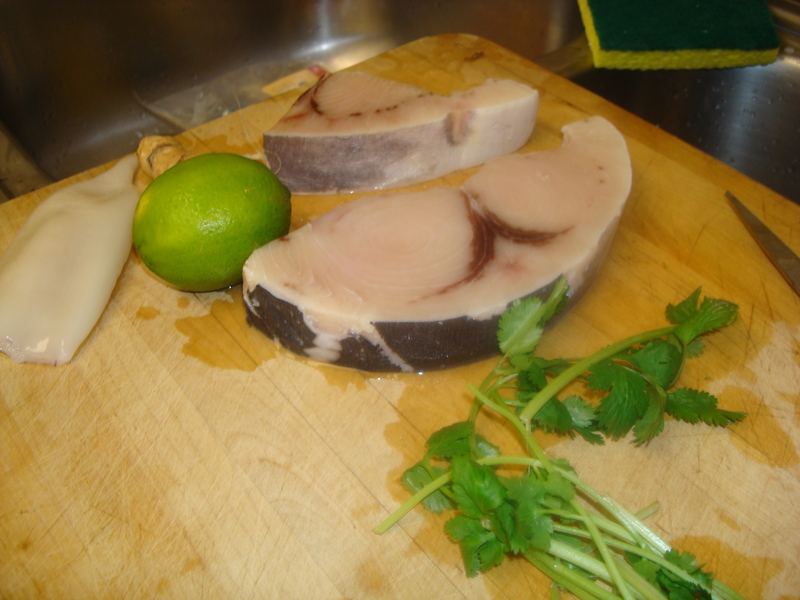 Cut up sword fish, red onion, cilantro and lime to squeeze. Put them on sticks by alternating: swordfish piece, red onion, shrimp, red onion, swordfish and so on. I just did the calamari separately. I grilled them until done, maybe 4 mins a side. It was delicious and fresh. The lime and cilantro are a perfect combination that doesn’t make you miss any oils or sauces. Perfect hard-boiled eggs. 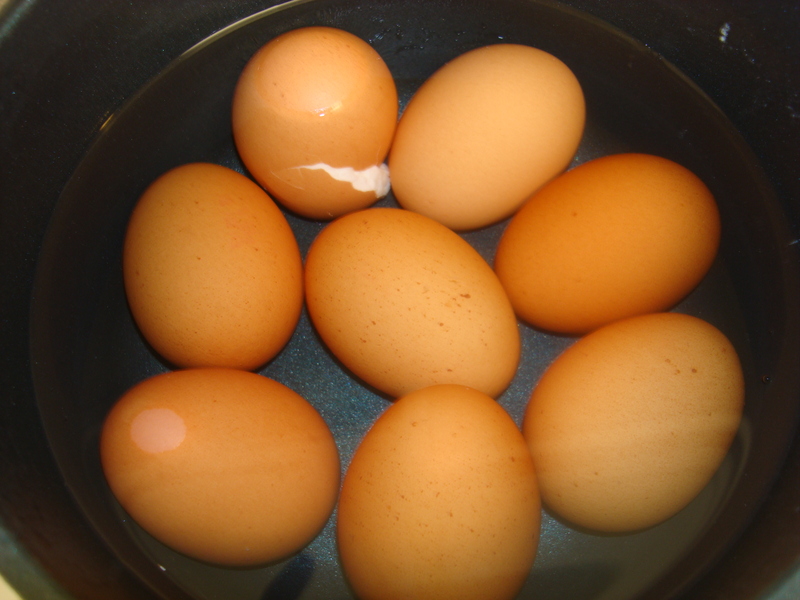 Put eggs in cold water and place on stove to boil. Once eggs are boiling, take off the stove and cover for 20 mins. Voila a perfectly boiled egg. It’s best to quickly cool them after the 20 mins because it makes the shell easier to peel. For dessert we had yogurt. This was a very interesting dinner. 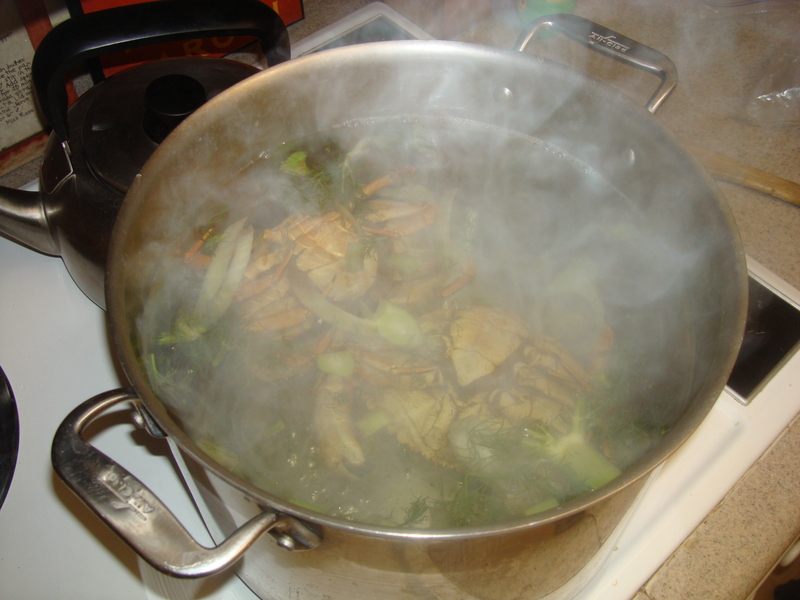 I put fennel, peppercorns and salt in a pot and boiled our crab. It was more work than anything to get the delicious morsels of crab out, but it made it worth our diet. The fish was delicious. I bought it at the fish warehouse on the docks of San Pedro. I am going there again to try something new. It was such great deal. I bought enough octopus for three meals, calamari, 2 whole fish and two crabs for 40 bucks. And it was absolutely deliciously fresh. I will not buy my fish anywhere else, now that I’ve discovered this amazing fish deal. 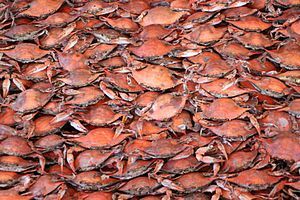 The crabs were ok but too much work. We had to youtube, while we were eating them, to see if we properly cleaned them. Basically, I put a bunch of aromatic things in a pot of water, waited for it to boil. Took my two crabs that I had placed in the freezer for 30 mins, so they would be easily placed in the water and boiled them for about 15 minutes. 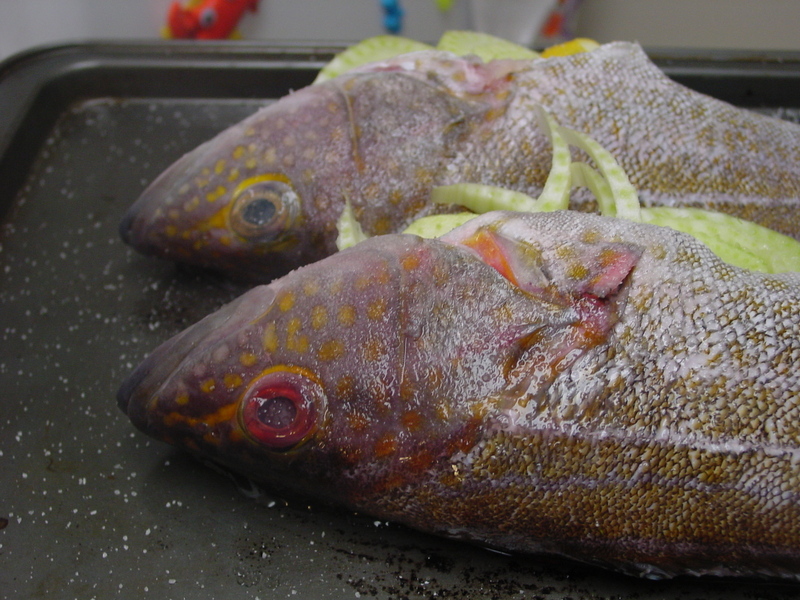 The fish I used my branzino recipe that is on previous posts. This diet isn’t so bad because we are trying different things. 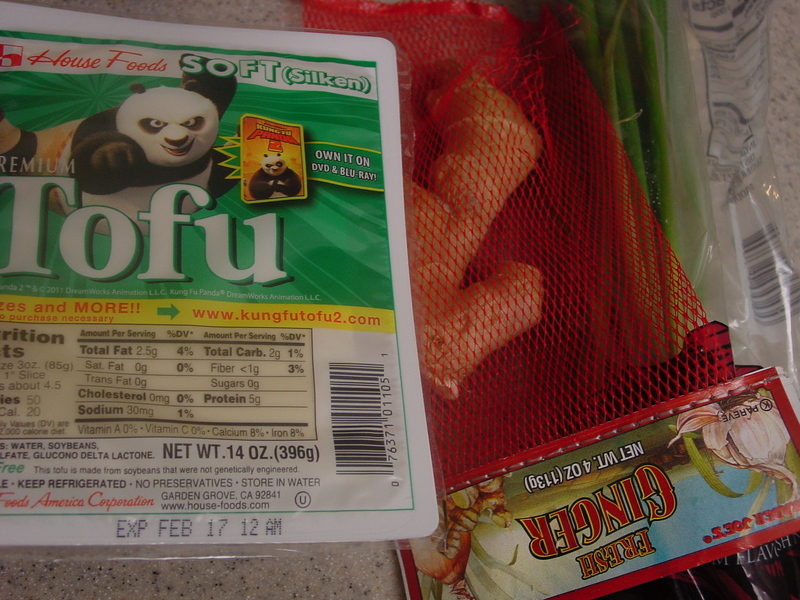 And you can’t go wrong with tofu, ginger, green onions and some soy sauce. Yum. diet. It will be the first time ever that we go on a “diet” or more appropriately, a change of lifestyle when it comes to eating. I will be making many different dinners following his diet advice closely. So we shall see how much our dinners change. My husband will be happy to know that when we are in the maintaining phase we can have our pasta dinners again, but once a week. I’m very excited to try this new eating plan. Supposedly the initial weight loss will be fast but keeping it off will be a long process. For every pound one looses, you must have 5 days of concern, meaning just because you lost the weight, you need to continue to follow a plan to maintain it. I hope to lose 10lbs that I gained making cookie over the holidays as well as falling back into eating processed foods. I never used to eat so much packaged junk, or starches but then again I lived in Italy for 2 years and the gorgeous bi-weekly market made it easy to eat fresh and healthy meals. So my advice to you, double your vegetable intake this year. Even our 5-year old son craves veggies of all kinds. You never have to tell him eat your peas and carrots. The rest however is another story. We are working on getting him to try new foods, mainly proteins. 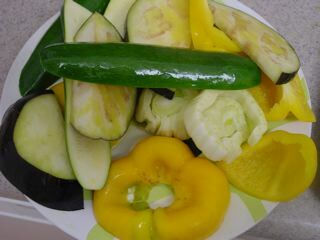 Once you start putting more vegetables in your diet, you will crave them to, just like my son. 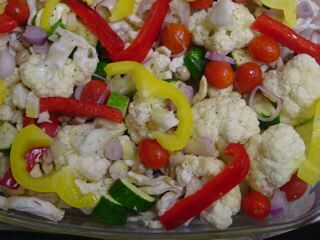 There are millions of different vegetable combinations possible, you have no excuse not to eat them. And eating french fries, with ketch-up doesn’t count as a vegetable. Last night I made another version of my grilled chicken with lemon,herbs and garlic. I altered the recipe slightly due to forgetting to steam the broccoli and adding some Herbs de PV, a salt mixture my friend made. The salt mixture was beautiful however, I wasn’t expecting the fennel which didn’t go so well with my lemon garlic. I was planning on preparing the chicken for the BBQ with just the salt mixture which had herbs from our Rancho Palos Verdes cliffs: fennel, rosemary and lavender. However, Paul didn’t want just that. I prepared the chicken my usual way, chopping up some garlic, lemon rind,fresh thyme and fresh Italian oregano. Paul called and told me he would be home in 30 mins. Perfect timing. I started the grill, placed the delicious looking pieces of chicken and went back inside to prepare our side dishes. I decided to do the usual grilled zuchini and eggplant. I sprinkled some herbs de PV and drenched them in extra virgin olive oil. I also prepared 2 heads of brocolli to be steamed. This time I didn’t use the stems. Normally I peel the stems and chop them up in circles. It is delicious, but I placed them back in the fridge for another time. I went out to put the veggies on the BBQ and realized the gas tank had gone empty. Argh, this started my dinner process late. I managed to replace the tank. Paul came home. He had some work to do so figured he’d do it before dinner. I thought dinner was ready, the veggies and chicken were getting charred at this point, but I now was waiting for Paul to finish one thing. I then realized I’d forgotten to steam the brocolli. So long story short. 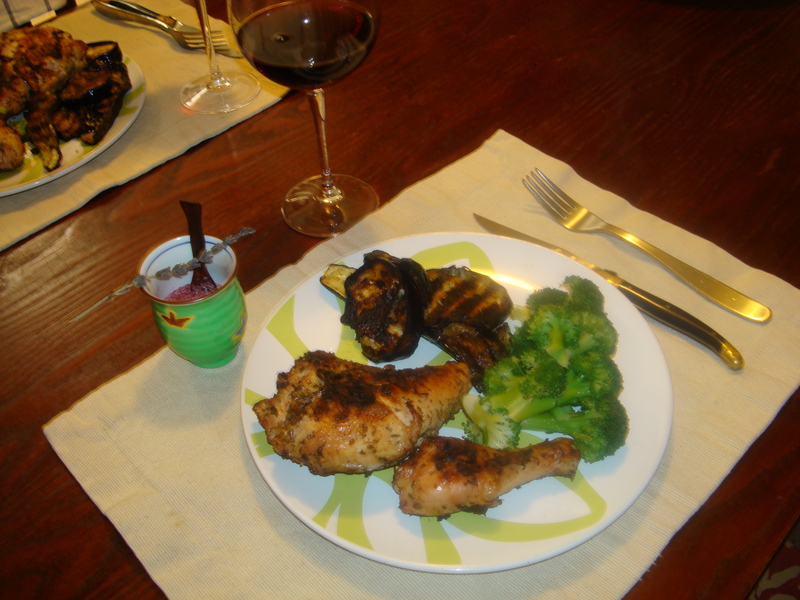 What was for dinner was charred veggies, chicken with a bit too much fennel. Not a successful dinner. The brocolli however, was cooked just right-still green but not too firm.